A strong bare arm, a sunburned, muscular neck--a young woman rests her head on his aching chest. She closes her eyes and listen with open, quivering lips to the words he whispers into her long flowing hair. I would give form to this as I now see it, but envelop it in a blue haze. These two in that moment when they are no longer themselves but only one of thousands of links tying one generation to another generation. People should understand the sanctity of this moment and take off their hats as if they were in church. I would make a number of such paintings. . . . Munch's grand ambition to paint 'feelings,' his dissatisfaction with an art concerned mainly with the faithful portrayal of natural appearances, was shared by a number of artists at that time, notably Van Gogh and Gauguin. . . . 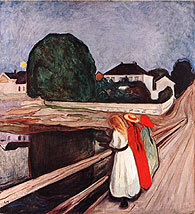 Munch's significance, the source of his continuing appeal, is that he gave the Romantic tradition a new twist and a new subject matter, and in the process be became a link between the Romantics of the nineteenth century and the Expressionists of the twentieth. The new subject matter was largely sexual in character. . . . He replaced the romantic sense of awe, with its religious implications, with the modern world's sense of anxiety, particularly sexual anxiety. His figures seem entrapped in a cycle of sexual longing, destructive passion, jealousy and death. . . .
[Art teacher Christian Krogh] introduced him to a world far removed from the confines of his family--the Bohemians of Christiania [now Oslo], a small group of anarchists and radicals who shocked and scandalized the placid middle-class society of the Norwegian capital in the 1880s. . . .
Emotion was one thing, but finding the right form to express these feelings was not easy. However, once revealed they were difficult to dislodge and Munch returned to the same image, painting it over and over again. "Art is crystallization," he maintained. 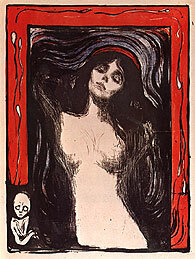 In 1895 he began making prints; this enabled him to repeat and refine his images and themes still further. The techniques involved seemed to give him fresh inspiration. . . . Finally he turned to woodcuts, and in this almost lost art form he showed amazing ingenuity. . . . But personal problems remained. He drank too much, he began to show marked schizophrenic tendencies and he became suspicious and unruly. Like Van Gogh in Arles he quarrelled with his friends. 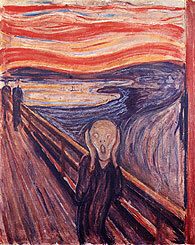 In 1895 he beat up the painter Ludvig Karsten, whose portrait he had just finished. . . . In Copenhagen in 1908, after a four-day drinking spree, he turned himself over to the care of a psychiatrist [and] underwent a series of treatments, including electric shocks, and he emerged, if not healed in his mind, at least cured of his alcoholism. 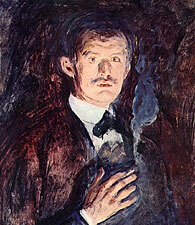 In 1909, urged by his Norwegian friends, he began his return to Norway, where apart from occasional trips abroad, he was to remain for the rest of his life, living alone, avoiding people, even his family, and painting. . . .
Over the next thirty years, Munch produced a great quantity of work, landscapes, self-portraits, repeats of earlier themes and some new subjects such as workers shovelling snow and returning home from work. . . .